Part 3 of a “how to” series to help you enjoy a first class Paris experience on a coach budget. Most hotels charge 9-12 Euros for continental breakfast, with some as high as 20 Euros for full breakfast buffet. You can purchase continental breakfast at a café for 5-7 Euros. Or stop by your local boulangerie for a fresh baguette, about 1.60 Euro, or croissants at 1.10 each. 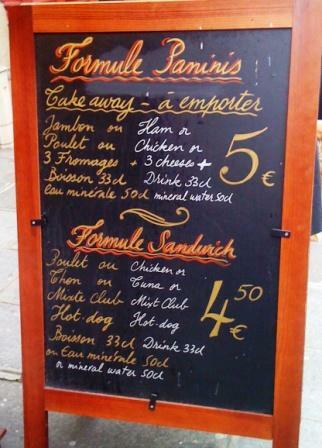 For lunch, look for the “formule” or “menu”, or “Plat du Jour” which is the daily special, a multi-course meal which costs less than ordering individual items “a la carte”. You’ll notice portions in France are not “super-sized”, which is another reason the French are slender. Picnic – Paris is a treasure trove of markets selling fresh produce and artisanal products. Wander through a market and pick up fruit, cheese, a fresh baguette, bottle of wine, and enjoy your picnic in the local parks. Rotisserie chickens are delicious; many vendors will sell half a chicken – ask for “demi”. When choosing your hotel, look for one with a mini-fridge, perfect for storing juice, yogurt, cheese, wine and picnic items, etc. Best money-saving tip for Dining out? Rent an apartment with a kitchen, and eat in several meals a day. Grocery shopping in a foreign country is a delightful glimpse into local culture, and much more affordable than eating out three meals a day. On a recent trip to Paris, we rented an apartment and spent about 100 Euros for groceries for 3 people for 6 days (including one “fancy” dinner with hors d’oeuvres, wine and a cheese course). On average, we ate in 2 meals/day, which works out to 2.78 Euros/meal. With one meal & one snack eaten out each day, averaging 15 Euros, that brings the food budget down to about 20 Euros per person/per day, instead of 50 Euros. That’s a savings of 540 Euros over 6 days! Be sure to factor in this savings when deciding whether to choose a hotel or apartment. No need to do any major cooking either, as there are many gourmet frozen foods, fresh pastas, hundreds of cheeses, etc. 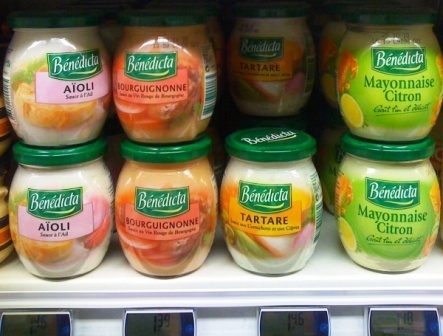 Grocery stores in Paris have many specialty items you won’t find back home, some of which make great gifts, like gourmet mayo and mustard, chocolate bars, teas. Neighborhood groceries include G20 and Franprix, larger hypermart stores are Monoprix, Auchan and Carrefour. Street snacks are a great way to enjoy a quick lunch on the go. Crepes are a local favorite, and come in both sweet (Nutella!) and savory. Croque Monsieur is a French version of grilled cheese sandwich, but with a delicious twist, cheese on the outside, usually ham on the inside. Street snack pricing will vary by arrondissement. 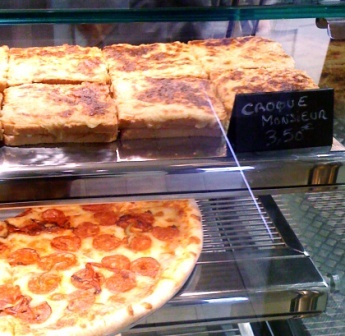 The 6.00 Euro Croque Monsieur in the 7th Arrondissement was only 3.50 in Les Halles. Ethnic eateries and take-aways are wonderful, lower cost options. Falafel stands do a bustling business in the Marais, and you’ll find many Greek, Middle Eastern, Indian, African and Asian dining options, depending on the neighborhood. 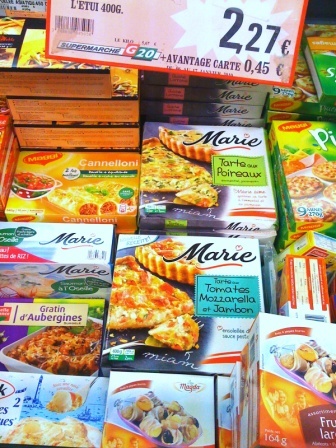 The word for food “to go” in French is “ a emporter” pronounced “ahm por tay”. “Traiteurs” are food establishments usually set up delicatessen style, displaying prepared dishes “to go”, with limited or no seating. In a café, resist ordering soda with your meal. A Coke can easily run 5-6 Euros at a sit down restaurant. The house wine is often cheaper. If you’re a soda fiend craving a Coca Light, buy a liter at the local grocery and enjoy it in your hotel room. Another way to save money, don’t order bottled water in a café or restaurant. The waiter will be happy to sell you the 6 Euro bottle of Evian or Pellegrino, but instead ask for tap water, une carafe d’eau (doh), s’il vous plait. For popular restaurants, reserve in advance. If your French is limited, ask the hotel if they will call to reserve for you. 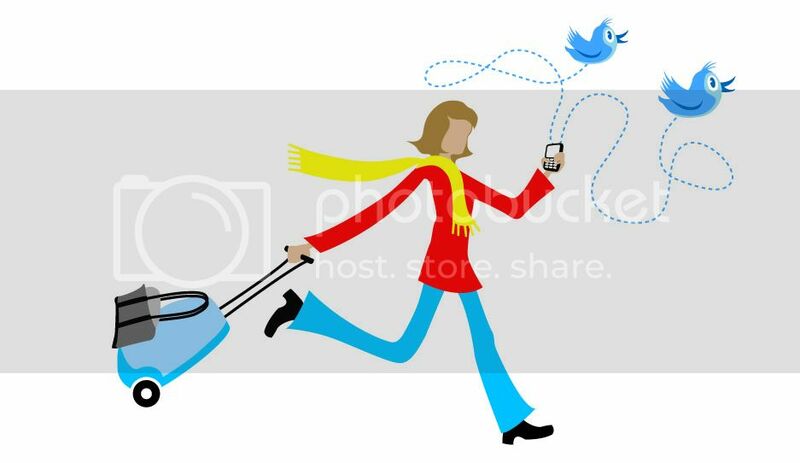 Or you can check out websites that handle advance bookings. Google “France restaurant reservations”. Restaurants touting a tourist menu in 7 languages = fail. Upscale restaurants may offer lower prices at lunch than at dinner, so check into this if you’ve been dying to try a famous chef’s establishment. Be sure to inquire about advance reservations. Service is included in your bill in France, which means no tipping is required, or expected. You can leave a few coins if you feel obliged, or a few Euros to reward outstanding service. Waiters in France do not hover, they won’t check in with you every five minutes, nor will they assume you want to be on a first-name basis. They are in no hurry to turn the table, as they do not rely on tips. The table is yours for as long as you like, and when you’re ready, you’ll need to ask for the check. L’addition, s.v.p. It’s considered rude to present the check early, or to continually pester diners. 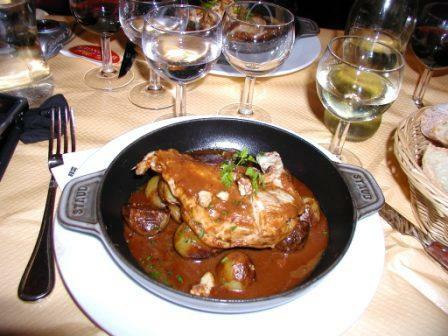 A note on dining manners – as a culture, French people are quiet, polite and reserved, so try to keep your voice down. If you need to attract the waiter’s attention, simply raise your hand, catch their eye and say “Monsieur” or “Madame”. With so many dining options, it’s good to research in advance. Invest in a guidebook on Paris dining. One book I’ve enjoyed recently is “Clotilde’s Edible Adventures in Paris”, by Clotilde Dusoulier. And definitely check out David Lebovitz blog and see his post on 10 insanely delicious things you shouldn’t miss in Paris. 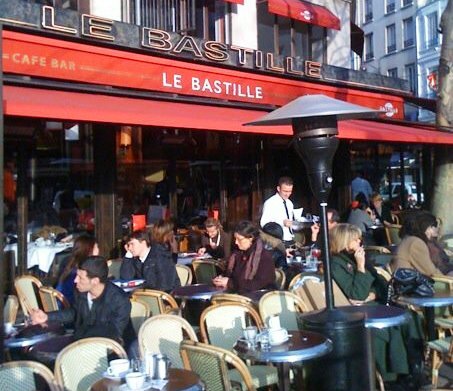 You may save money by ordering your beverage at the bar, but for the quintessential Parisian experience, be sure to stop at a sidewalk café. Linger a while, the table is yours for as long as you like. Rest your feet, read a book, write postcards, or just enjoy people watching. Remember, you’re not paying $10USD for a cup of coffee, you’re paying for a place to relax and enjoy the sights, sounds, and free fashion show that is the Paris street scene. One last tidbit – Café culture suggests you and your companion sit side by side, facing out towards the street. So don’t be a tourist and sit with your back to the street action! What are your favorite tips for dining in Paris? Do you have a favorite restaurant, café, or guidebook to share? Click to leave a Comment below and share it with us. Prices are current at time of publication but always subject to change. 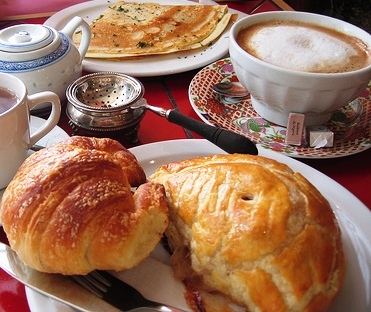 All photos are my own except petit déjeuner, courtesy of Birdfarm, via Flickr with Creative Commons license. 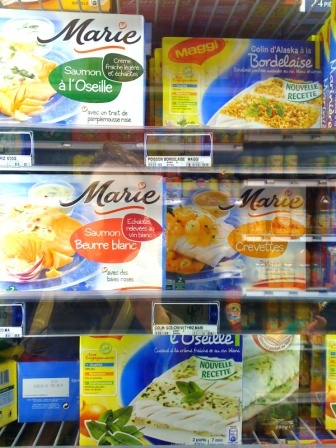 This entry was posted in France and tagged Auchan, bistro, cafe, Carrefour, eating out, Franprix, G20, Monoprix, Paris, restaurant on February 20, 2010 by enchantedtraveler.